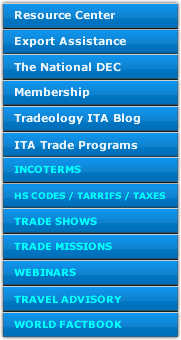 Webinars and Guides on different Export-related topics. 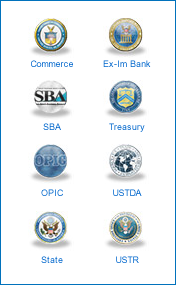 Trade-related services; market research, trade leads, trade show directories, company directories..
U.S. Bureau of Industry and Security, U.S. Department of Commerce. Lists To Check - Export Control Basics - Seminars and Training - Licensing.. The Office of Foreign Assets Control (OFAC) of the US Department of the Treasury administers and enforces economic and trade sanctions.. Supports the financing of U.S. goods and services, turning export opportunities into real transactions, maintaining and creating more..
SBA.gov is the official website for the U.S. Small Business Administration, dedicated to providing support to small businesses across the nation..
International Federation of Freight Forwarders Associations (FIATA) Trade association representing freight forwarding and logistics firms. Includes membership list and websites of affiliated national associations.. The U.S. Government views the sale, export, and re-transfer of defense articles and defense services as an integral part of safeguarding U.S. national security and furthering U.S. foreign policy objectives..
U.S. Customs and Border Protection secures the homeland by preventing the illegal entry of people and goods while facilitating legitimate travel and trade..
U.S. Census Bureau - FOREIGN TRADE is the official source for U.S. export and import statistics and responsible for issuing regulations governing the reporting of all export shipments from the United States..
Food and Drug Administration - Exports Under the FDA Export Reform and Enhancement Act of 1996..
A reliable freight forwarder will be crucial for the worldwide movement of your cargo.